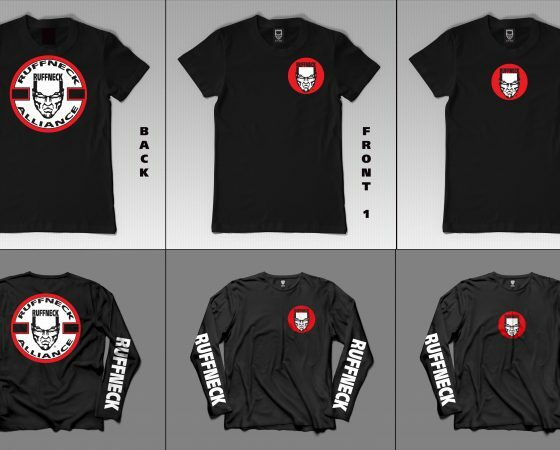 Ruffneck Alliance Classic Shirt – Short & Longsleeves ! Home / News Category / Ruffneck Alliance Classic Shirt – Short & Longsleeves ! I held a small questionaire on one of the Ruffneck fanpages on facebook and the outcome was the demand for the original Ruffneck Alliance shirt as it was made back in the days. Since the opinions where about 50/50 on the placement of the front logo i have decided to actually give you the choice and make this item available RIGHT NOW in a pre-ordering phase to avoid wasting waiting time. Furthermore i have actually expanded the size of the shirts for the bigger followers up unto 5 XL! On top of that, those already know visiting the 25 YOR party at paard at 10-11-2018 can order the shirt, and during the checkout process select: Ophalen at paard. In that case NO SHOPPING COSTS FOR YOUR ORDER WILL BE CHARGED!